Canon U.S.A. Inc., a leader in digital imaging solutions, today announced the launch of three new compact and lightweight Full HD camcorders, the Canon XA15, XA11 and VIXIA HF G21. Delivering first-class optics, powerful sensors and a range of versatile features, these camcorders are perfect for a broad range of video productions. The Canon XA15, XA11 and VIXIA HF G21 Full HD camcorders each provide videographers with a spectacular 20x 26.8mm-576mm optical zoom lens allowing a user to easily capture a variety of scenes with superb image quality. Canon’s HD CMOS Sensor and the powerful DIGIC DV4 image processing platform deliver great performance in low-light and the ability to capture superb Full HD images in 60p at 35Mbps. Wide DR mode supports the smooth compression of high luminance areas to achieve 600 percent DR making it possible to shoot with smooth color gradation and suppressed overexposure. This is applicable to any shooting environment where the difference between light and dark areas is prone to causing overexposure. Flexible image expression is supported by a Slow/Fast Segment function that enables users to select shooting speeds from 0.4x to a maximum of 1,200x, and a Hi-UD lens supports the reduction of chromatic aberration and drives vivid imaging. These camcorders are capable of recording in both AVCHD and MP4 formats, at multiple bit rates, simultaneously, to Dual SD card slots. All camcorders offer HDMI, headphone jack, optional GPS support and the XA15 and XA11 models offer XLR professional audio terminals. 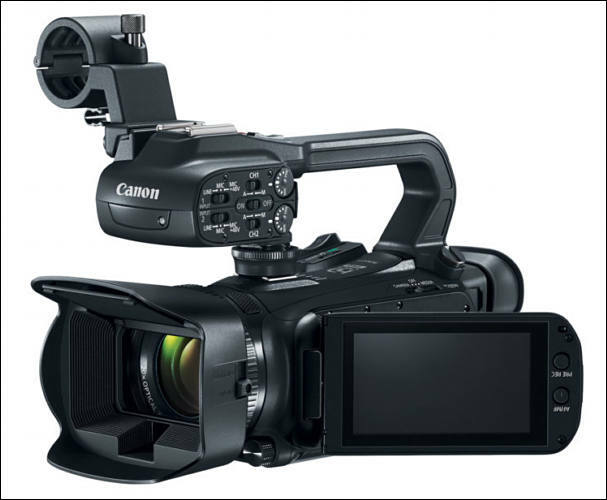 Additionally, the XA15 model also features a HD-SDI output. Comprising of a compact and lightweight body, each camcorder is ideal for high-action shoots when both speed and mobility are essential. Dynamic Mode provides 5-Axis image stabilization – roll axis, horizontal roll, vertical roll, up-down and left-right – to help facilitate smooth image capture in various styles of fast-paced shots. The VIXIA HF G21 is identical to the XA15 and XA11 in performance, but does not include a handle. The Canon XA15, XA11 and VIXIA HF G21 Full HD camcorders are all scheduled to be available at the end of December 2017 for an estimated retail price of $1899.00, $1399.00 and $999.00 respectively*. For more information please visit, usa.canon.com. 3 pieces of junk from Canon.